Yesterday’s post probably clued you in to what was coming next. Though I’ve chosen to make super sporty Avocado Hoodies, I think these versions live up to their Disparate Disciplines’ Date Night theme since my husband and I are the kind of people who think honeymooning in the Alps is about the best thing ever. Plus, any outing in a skirt like this one must be a date, right?! I’ve been curious about bamboo fabric ever since my husband came home from a Search and Rescue team meeting one day back when we were in graduate school and told me that everyone on the team was switching to socks made out of bamboo because of the natural anti-bacterial properties of the fabric. (If you’re curious, his Search and Rescue team was an amazing group of volunteers that would get called out into the wilderness when people would get lost or injured while hiking or otherwise galavanting in the great outdoors.) I don’t talk about it much here, but I’ve been a competitive runner since high school and love being outside. Almost every morning starts with a run, and if I had my way, every weekend would involve some time on a trail. Having athletic gear made out of a fabric that would naturally fight off odors sounded fabulous. But, years passed and nothing made of bamboo made it into my running gear. Well, that is until I found Mood Fabric’s selection of bamboo jerseys. To start off I chose two fun colors, hot pink and pale blue, since I like to be visible when I’m on the trail and since I knew I wanted to make something for both me and my husband. The pattern choices were easy, too. 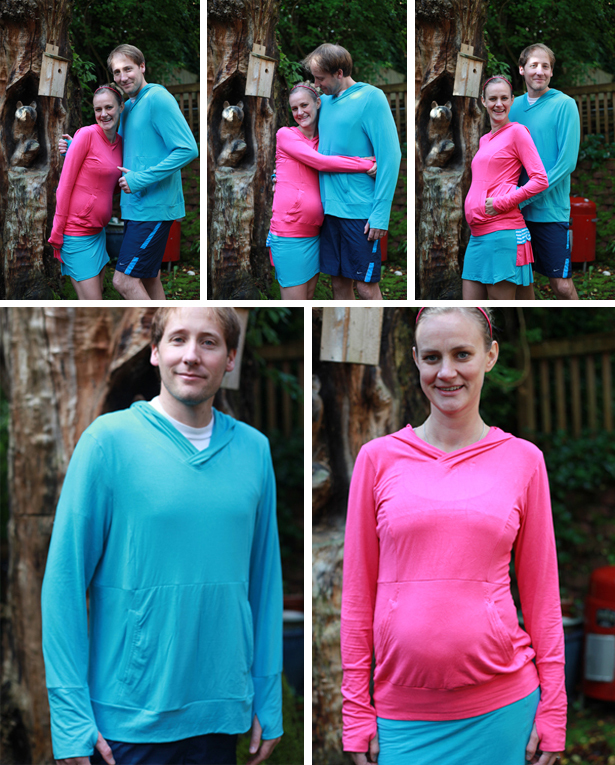 I’d received the Men’s and Women’s Avocado Hoodie patterns from Disparate Disciplines for backing the new pattern company’s Kickstarter campaign, and I’d been eagerly awaiting cooler months in order to try out the design. I also made a coordinating running skirt for me from Jalie 2796. The Avocado Hoodie pattern not only comes with a hood, but also comes with a large kangaroo pocket in the front that wraps around to the back to also give your partner somewhere warm to put their hands when you’re walking with your arms around each other. The pattern seems to run a teeny bit large, at least based on the fact that it still fits me pretty well despite cutting out my pre-pregnancy size and the fact that I cut my husband’s button-down shirt size and he has plenty of room for layers underneath. But, the sizing could seem large because of the awesome stretchiness of the bamboo jersey. This stuff is soft and pliable and just all kinds of awesome. That said, I might just have to make my next version out of this Thakoon sweatshirt knit to test my sizing theory. Anything for the sake of science, right?! Regardless, I think my husband and I are both quite happy with the fit, even if it is a bit looser than some of our other athletic gear. Plus, it’s bamboo, and we’re excited to see if these hoodies live up to my husband’s former team’s anti-bacterial hype. 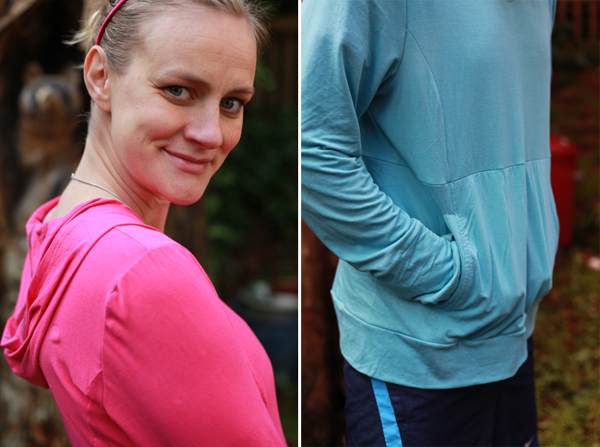 I chose to line my pockets with the pale blue bamboo jersey as a fun little surprise. My husband’s version was made blue through and through. On both hoodies I serged all of the exposed edges using a blue thread to continue the theme. It adds more fun to mine while being more subtle on my husband’s. The kangaroo pocket is designed to be one big pocket that wraps most of the way around the hoodie, but I decided to break the continuity by stitching the front pocket down to the pocket lining. Though the back pockets end up being much smaller that way (though still large enough for your partner to keep their hands warm), it helped to keep the front pockets from gaping open when stretched over my baby bump. I also hand stitched down the sides of the pocket tabs so they’d stay neatly in place as well. I found it pretty easy to work with the bamboo jersey, which gave me the confidence to topstitch around the neckline to hold the hood in place instead of using the pattern’s neckline facing pieces. I love hoodies, even if I rarely use their hoods. It’s just fun to have a hood. But, who knows? Maybe I rarely used hoods in the past because I lived in sunny, warm California. Perhaps Seattle’s seasons will teach me that hoods can actually be functional! The pattern doesn’t call for these hoods to be lined, so I just serged the center seam. I also serged the edge of the hood before I turned it under and hemmed it. I like the way the blue thread jumps out again against the pink fabric but almost disappears against the blue fabric. 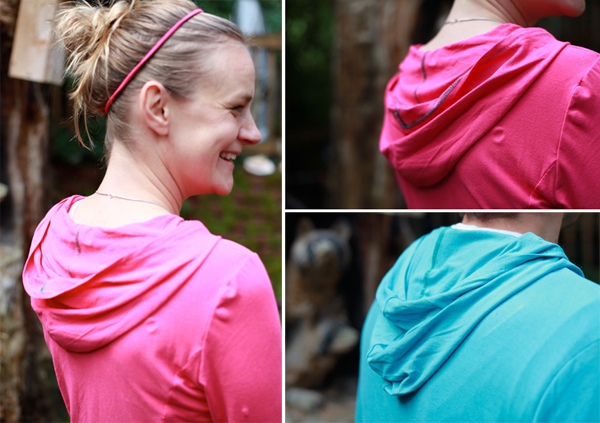 Also, you can really see the lovely drape of the bamboo jersey in the hood. One final cool feature of this pattern is the thumb hole engineered into the sleeve cuff. 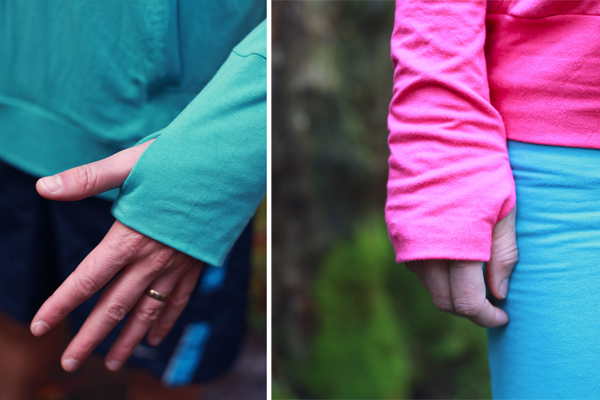 All of my favorite long sleeve running shirts have thumb holes, and I’m really excited to now know how simple it is to make nice, neat thumb holes in cuffs. I’ve made this skirt pattern once before, back in my pre-serger days. Even though Jalie gives detailed instructions for how to sew seams without a serger, I’ve been dying to make it up again ever since I got my serger. I knew I wanted to make it in a larger size (since round one looked more like a mini skirt than a running skirt! ), and ever since I was introduced to Lululemon’s pleated running skirts, I’ve wanted to try adding pleats to the back as well. Since I had some left over bamboo jersey, I figured it was meant to be! Everything came together quickly. As with the hoodies, I used my serger everywhere I could and my sewing machine everywhere else. The jersey cooperated perfectly with both machines. I added the pleats exactly the same way I added the shingles to my ombre striped jersey dress. Since I had no pattern pieces for the pleated layers, I just cut really long strips of fabric, each about 5″ wide. For the bottom layer I used the blue to give continuity with the hemline on the sides and the front of the skirt. For the middle layer I used the pink since I thought it would be fun and nicely tie the skirt in with the top. 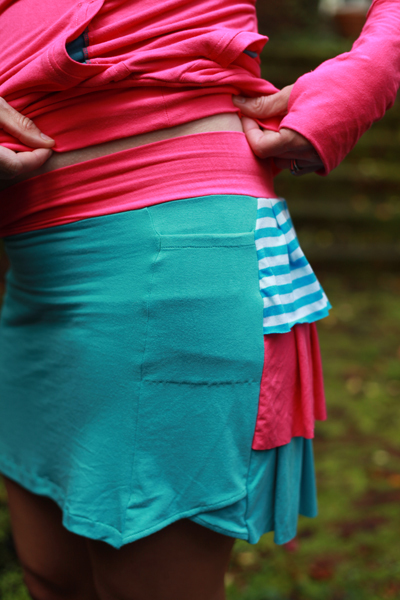 For the upper layer I used a leftover scrap of the cyan stripe from my ombre striped dress. I like the little bit of pattern that it adds. Though the skirt itself is turned under and hemmed, I left the edge of each pleated layer raw. The skirt sides are designed to have functional pockets that actually keep things in thanks to a bit of 1/4″ elastic at the top. Finally, to add to the color blocking crazy, I made the waistband (and bloomers underneath!) out of the pink bamboo jersey. 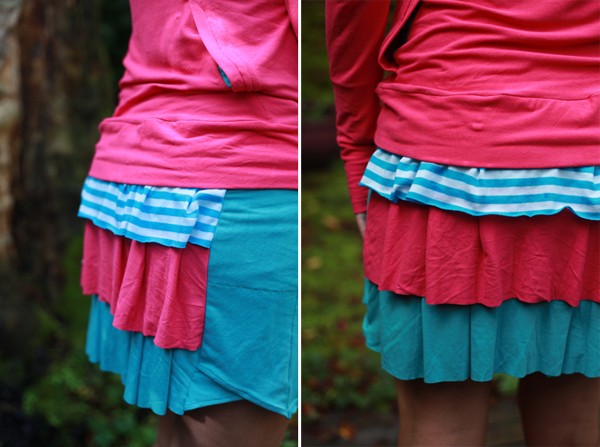 This running skirt is bright, colorful, and fun! I’m excited to get out there and explore the roads and trails around Seattle. Now if only I could find my pre-pregnancy energy levels! Previous Post PDF Pattern… Packaging? Next Post SA Curve Measuring Wheel: Review and Discount! Very nice! I’m loving that skirt. You look so great in your outfit! Thanks! I’m starting to feel very pregnant though, and I still have a few months to go! That first picture is just too cute! What a great casual outfit – perfect for looking cute while being active! Thanks! Right now I need a bit of a boost – hence the cute outfit – since my pace has slowed down quite a lot these last few months! 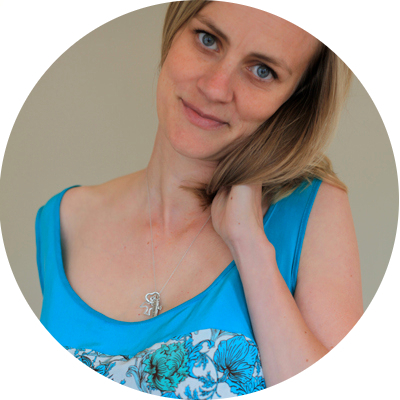 Amy, I just love what you do and your incredible blog. Thanks! I’m so glad you follow along. Those two are really great people. I miss them so much! Very cute — love that skirt! Great photos of the two of you! Thanks! We had a blast taking photos together in the sprinkling rain! Thanks! I try to stay active, but it’s getting harder and harder these days! Really cute skirt. The hoodies tuned out great. Thanks! I highly recommend the pattern if you’re in the market for a hoodie. Next time I think I’ll leave out the back pockets though. what a cute ensemble you have created. great hoodies and I love the colors. And look at you!!!! so great to see you looking so lovely and “growing” since I last saw you. Thanks. Not quite your knock out ball gown, but a really fun outdoorsy outfit. Very cute, Amy! His and hers! I have seen that pattern but would make it with regular pockets, as I don’t walk entwined with anyone. 😉 I do like the thumbhole in the sleeve! And just look at that growing baby bump. You can definitely use the pink or the blue leftover bamboo for baby things! Thanks! I think I’ll make these hoodies without the back pocket next time as well. Save time and all the fiddly bits. Good to know you’d do the same! I love a good hoodie and wear them all the time! I haven’t come across this pattern before. I love it! Thanks for sharing! It’s a good pattern. 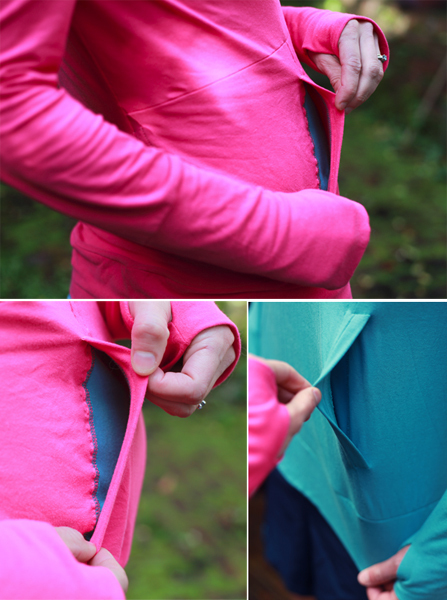 The princess seams give it a nice fit, and the pocket and thumb holes are really functional. You’re so cute! Super excited to see your growing baby bump. Maybe I’ll even make it north in time to see it in person! Your awesomely bright and fun running gear looks like something I would wear, you know, if I ran. But a bright pink hooded bike jersey, that I could actually get behind! Oooh! You might be moving up that soon?! Awesome! I can’t wait to have another sewing buddy in the area! GAH! These are too cute for words! I love the colours and the fact they have thumb holes. Win. But that skirt? The ruffles? Epic! Yes to colors and ruffles! Very cute outfits!! I love the tiered skirt you sewed as well. I have some bamboo knit as well, but think mine is thicker than yours so not sure it will have that nice drape. Thanks! The bamboo knit I used was definitely soft and drapey, not too thick. I think a thicker one would work well though since I think the hoodie pattern (and the skirt pattern if sized correctly) could handle a more substantial fabric just fine. More amazing Avocado Hoodies! Got to get my hands on this pattern. Looks so comfy! It’s a good pattern! You’ve made some awesome garments recently, so I’d love to see your take on this hoodie. You guys look so cute! I love these photos! My prof actually mentioned that bamboo fabrics tend to grow and not have as much spring; it tends toward buttery-ness more. That definitely comes across in your pictures! Oh this is just a gorgeous post! Especially since I didn’t know you were pregnant! Congratulations to you guys, yay family! It’s just the most wonderful experience! This is the second time I’ve read about the Avocado hoodie and it sounds like great bit of pattern drafting! I really like your his&hers versions. And I love the little running skirt! Amy, As an avid runner myself, I’m curious how the bamboo behaved while running. Did it stretch out, does it have any wicking properties? I much prefer running skirts to just shorts and love this pattern so I’d love to make my own. But I can’t find performance fabrics. Any suggestions? BTW, you look so healthy and happy! Thanks! So far the bamboo has behaved beautifully. It’s a lot more supple than my typical running clothes, which is great for staying comfortable with my ever expanding baby bump. Most of my dry fit shirts are having a hard time these days! And, my ready-to-wear running shorts have almost no stretch at all, and remind me every day just how much bigger I’m getting! The bamboo doesn’t seem to be stretching out yet, and a lot is being asked of it. But, I can’t really tell if it has wicking properties because my pregnancy is keeping me from running at a level in which I would need sweat wicked! I feel lucky just to be getting out for a run most days, even if that run is more of a shuffle! If I can get my husband out running in his, then I would definitely know, but it’s not yet cold enough here for him to want to wear a long sleeve shirt running. I’ll definitely let you know though. As far as performance fabrics, I’m keeping my eye out, but I haven’t yet found any. I remember Miss Celie of Miss Celie’s Pants mentioning finding Under Armour cold gear and wicking fabric at Guss Woolens in Baltimore. I’ve never tried calling them to see if they ship…??? This post makes me so happy! Love the skirt! This is exactly what I am trying to attempt. I’ve been looking up running skirt patterns and was trying to sort out how to tweak the Jalie pattern to look like the Lululemon pace setter skirt but longer. Your skirt looks fantastic! I’m actually making a few more similar running skirts right now! Awesome! I was thinking of getting some supplex for mine. And anything with pockets is always fantastic.